With a new burst of creative energy, comes an assessment of the rather terrible looking WIP list. There’s the 2014 & 2015 Frosted Pumpkin Stitchery block-of-the-month cross stitches. The 2012 Fat Quater Shop block-of-the-month quilt. (I’m sensing a theme here). The rainbow wave. A pair of socks. A cowl that I have now frogged. Project Life 2015 album. 2016 memory keeping in its entirety. 2017, for that matter… and on it goes!! The two I am focusing on at the minute, are my 2015 cross stitch, and the rainbow wave blanket. The crossstitch I have slowly been making progress on while I sit and help the children with their homeschool lessons. With three children at different levels, plus a preschooler under foot 3 days a week, it’s not the speediest of stitching, but every cross is a cross closer! I currently have the top row complete (excluding frames), and am approximately 2/3rds of the way through my first block of row two. My other focus project at the minute is my crochet blanket. This one is super exciting as this is a pattern I helped develop, along with a couple of crafty friends, and it’s so awesome to see it come to life! It came with me on a recent roadtrip to Cape York – 8000km makes for plenty of handwork time! The current row is the second last colour stripe of the first repeat, with I think at least 2 more repeats to go, to make it nice and snuggley. Our quilt group are planning a girls weekend in a few weeks on, so I’m shifting up my list making game a couple of levels, trying to decide my priority projects. Or possibly I’ll just pull my usual trick and take as much of my craft room as I can manage to jam in my car. Chances are, even with a list, I’ll take far too much and touch nothing. What is it about thoughts and counting?? Aaah! Peter Pan had so many colour changes! 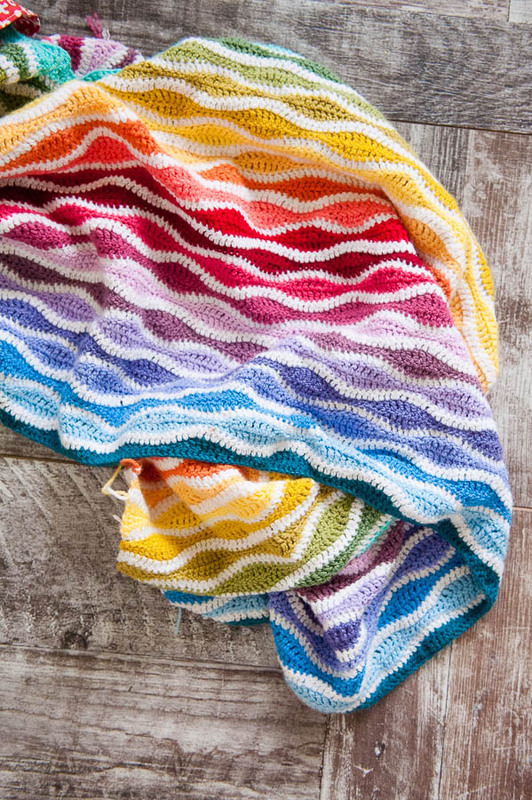 I am reconsidering restarting my wave blanket… I think I chose too many colours.